Go figure. At the very least, you’d think they’d invite Ornstein and just book him opposite some Republican who could take the other side of the argument. So why haven’t they? Maybe they couldn’t find any Republicans willing to do it. It’s sort of a no-win proposition, after all. 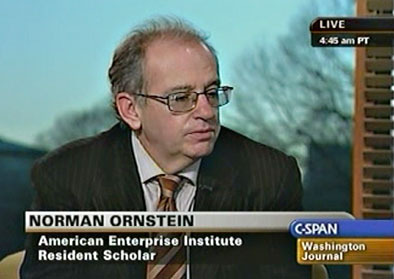 And without a he-said to balance Ornstein’s she-said, I guess he’s too hot to handle.